Oh summer! Ice cream trucks and water-side refreshment huts full of frozen treats and for me… one hot stuffy house where ice cubes, wet washcloths and an industrial-sized floor fan make a stand-in for proper air conditioning solutions. On that note: You’re fired “AC”. When the house burns hotter than the weather map claims, it’s time to step outside…seek shade and cool down from the inside out. Preferably with something so cold it will make you wince in the sweet freezing pain that is called instant relief. 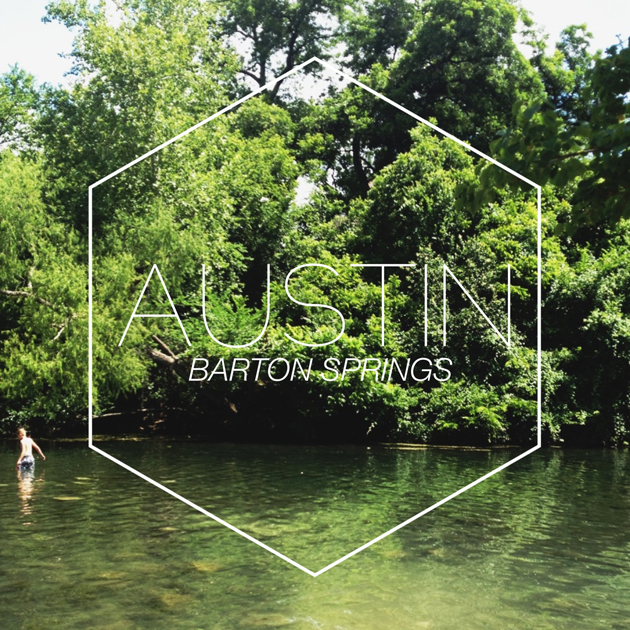 While checking out (read: completely melting) Barton Springs on my recent trip to Austin TX, I became so delirious with summertime humidity that an oasis offering fruity sanctuary appeared before my eyes. Okay it was the community refreshment shack but what really caught my attention was the colorful hand drawn letters spelling out “Tigers Blood”. Obviously this needed to be investigated further. As it turns out, Tiger’s Blood does indeed have magical powers. All unintentional Charlie Sheen references aside, this syrupy mixture of cherry coconut and watermelon is tropical, delightful and saved me from some serious beach-side heat stroke. Amused by the mixture of flavors, I instantly started to think of other ways this so-called “Tigers Blood” could be re-imagined. And then my mind went to happy hour. Upon returning home, I called upon good friend and cocktail concierge Nathan Hazard and requested assistance in solving my summertime beverage bewilderment. Once again he was happy to come to our refreshment rescue just in time for the weekend! Can I get a Cheers in the back!? ¡Salud! Combine all ingredients with the exception of soda water in a cocktail shaker over ice. Shake well and double strain into a Collins glass filled with ice. Top with soda. 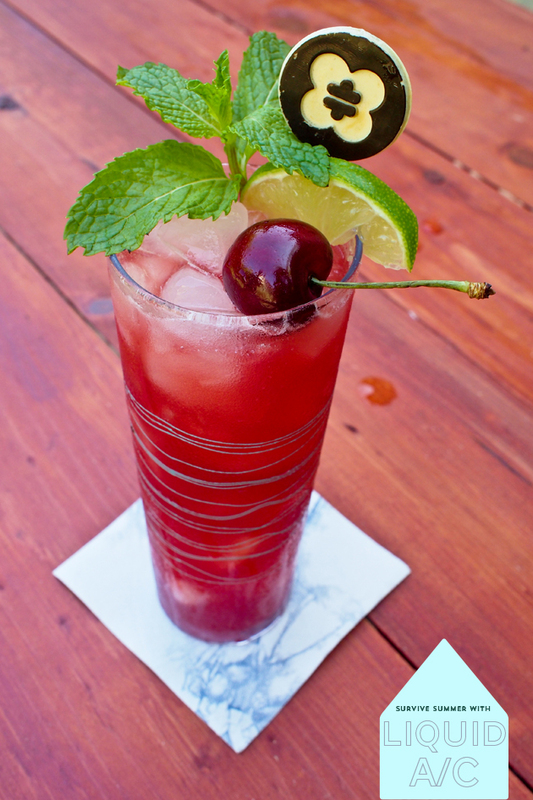 Garnish with a mint sprig, lime wedge and cherry. Line a baking sheet with parchment paper and spread evenly with shredded coconut. Bake for about 5 minutes or until fragrant and golden on the edges. Rake with a fork to evenly redistribute and continue to cook for another 3-5 minutes until lightly browned. Remove and cool. Pour in a mason jar and top with Tito’s vodka. Agitate and store in a cool dark place for at least 12 hours. Double strain before use. Ah! Tigers Blood at home. See?! 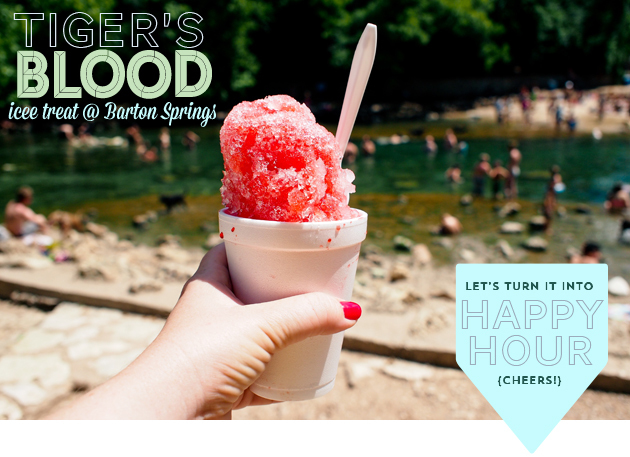 Dreams do become realities and Texas icee spring-side treats can also be delicious in libation form. This cocktail is perfect for any easy sipping hot as an oven afternoon…preferably underneath an umbrella accompanied by a large stack of new magazines (Obviously). Here’s to your glass being chilled and your afternoon sans heat hypnosis. Happy weekending Friends!! 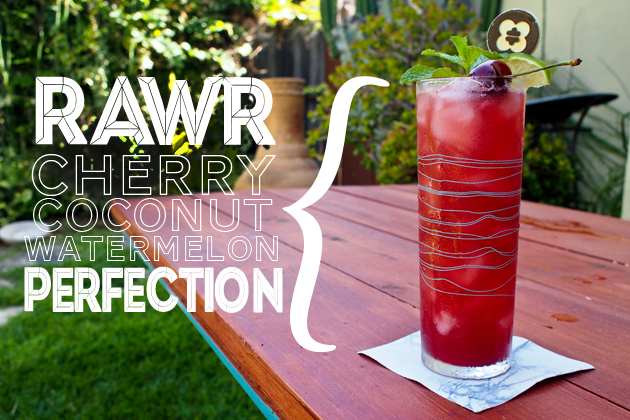 Check out these other two summertime cocktails that will send you into vaycay mode STAT! You’re singing my summertime pain, lady. I live in Tropical Queensland, heree in Australia, and I hate the heat. A tiger’s blood cocktail would take the edge off nicely. I’ll file this away for summer. Maybe even turn it into a granita? Oooooooh a granita would be ace! 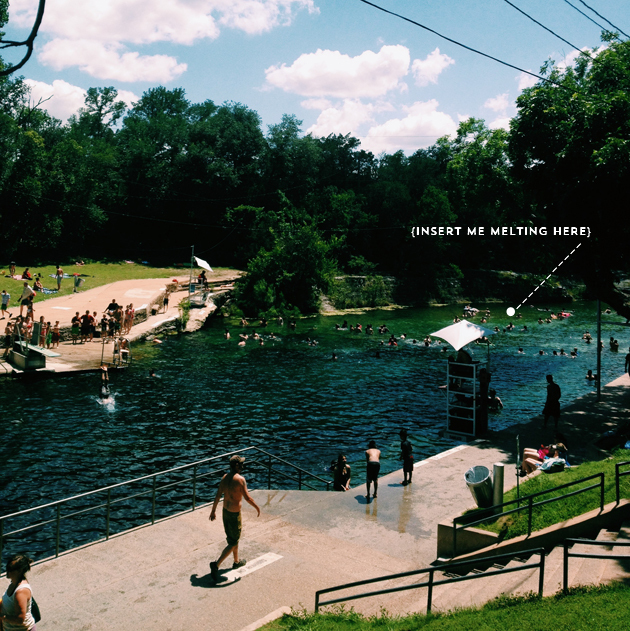 Send me some of your winter cool please…I’m melting.